About two months before Christmas, my mom decided that my grandma needed fingerless mitts to keep her hands warm during the day – and that I should make them. I decided that Delicato, a pattern I’ve knit before would be the order of the day, and started searching out yarn possibilities. Once my mom decided which yarn she liked best, we ordered the yarn, it arrived…and I avoided knitting them. Around about Thanksgiving I decided I’d better not put them off anymore, and started, completely winging the needle size based on past experience (which worked out perfectly). It was a slow start. As I mentioned in my last post, knitting wasn’t exactly my friend in 2012 and my wrist was bothering me. As Christmas inched closer however, I had no choice so I sat down for a marathon day of knitting–and was rewarded by feeling much better about both the craft and my wrist. (True culprit for the wrist pain is, I believe, the computer–which alas, I cannot completely avoid.) I completed them in just the nick of time, and my grandma both likes and has been wearing them. Win! It’s a good thing I enjoyed making these again–my mom has requested a pair from the leftover yarn! I don’t know how quickly I’ll get to them, though–since I last posted, I was offered a full time job (income, yay!) with a long commute (1 hour drive – no public transport option, boo! ), so my time will be more severely limited than the last couple years. But they are definitely near the top of the list! 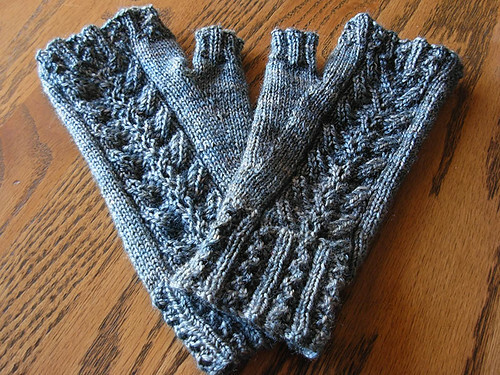 The mitts look wonderful! I really, really need to knit myself a pair one of these days. I’ve been saying that for years, though, and it hasn’t happened yet. Maybe 2013 is the year!